Of the Doctor Who companions, Clara is my favorite. But I do love Amy Pond as well. 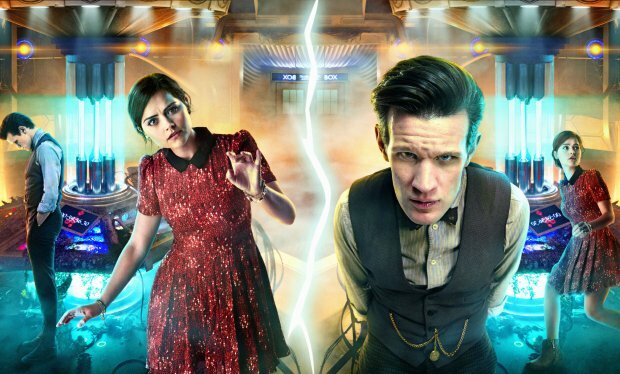 I actually didn’t like Amy at first because it was just her and the Doctor; I much prefer the dynamic of Amy and Rory together since they compliment each other so well. Recently while looking for some new boots, I happened across two of Amy’s screen accurate boots still available on Amazon in my size. I snapped them both up since 1) I have always wanted a pair of Dr. Martens, 2) Amy wears flat shoes, and 3) together they cost less than Clara’s Christmas special boots. Well, once I bought them the next logical step was to cosplay Amy. I have reservations about doing so since Karen Gillan is a redhead and Scottish and I am obviously…not. But I have always encouraged cosplayers of any race and origin so I thought why not. Two of Amy’s outfits that I really like and stood out are her Night Terrors outfit and the one she wears in Let’s Kill Hitler. Luckily they are also the two in which she wears the Dr. Martens. I decided to start with the Night Terrors outfit since I really liked the dress she wore in it. The boots are the screen accurate Dr. Martens Triumph 1914 in black. They are a tad long on my foot, but the width is perfect. Since they lace up so high and can accommodate thick socks I didn’t want to run the risk of returning them and ordering a smaller size. 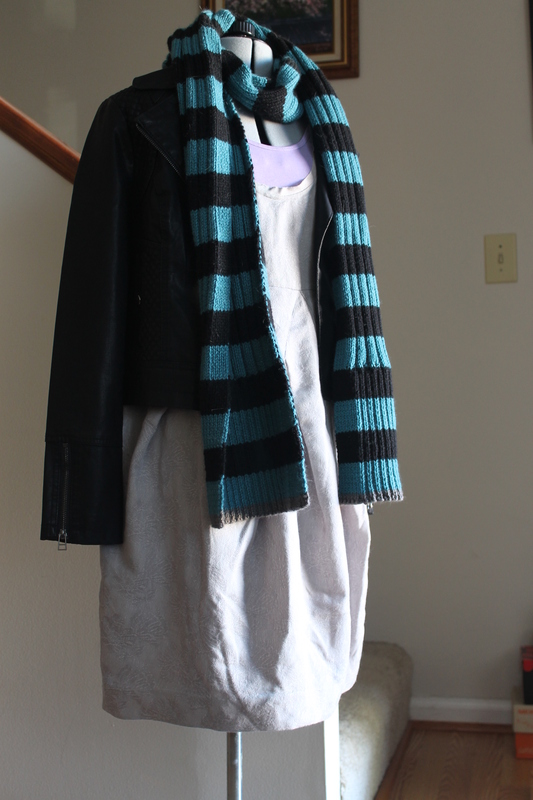 I managed to get the screen accurate Noa Noa wool dress from a fellow DW cosplayer in Austria who was selling hers. I spent a pretty penny on it but it was new and unworn, and making it would have cost me nearly the same amount in labor time. 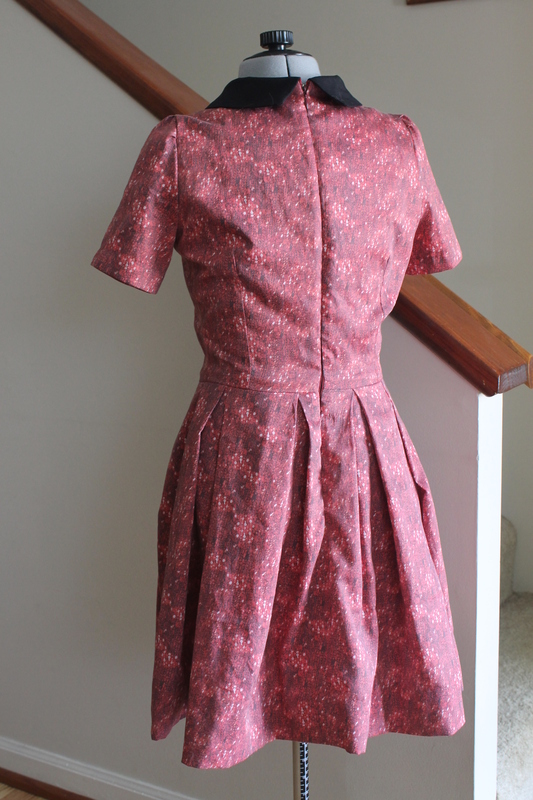 I may still attempt to sew my own version just so that I have a warmer weather version as well. 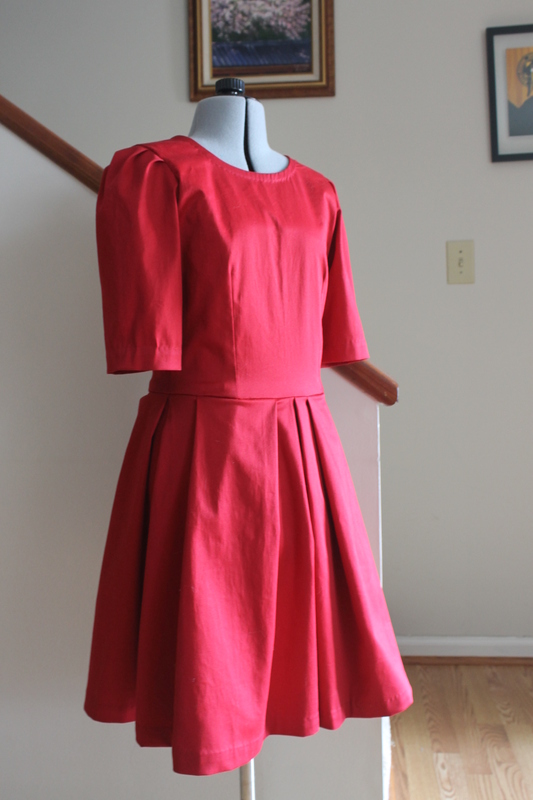 The dress is a size small; it fits me perfectly in my slightly broad shoulders, a little larger at my narrower waist, and hits above my knees. I’m a good deal shorter than Karen Gillan and had contemplated hemming it to the appropriate length, but that length is much shorter than even my shortest skirts and dresses. I decided I’m going to have to go for inaccuracy and leave the dress as is. 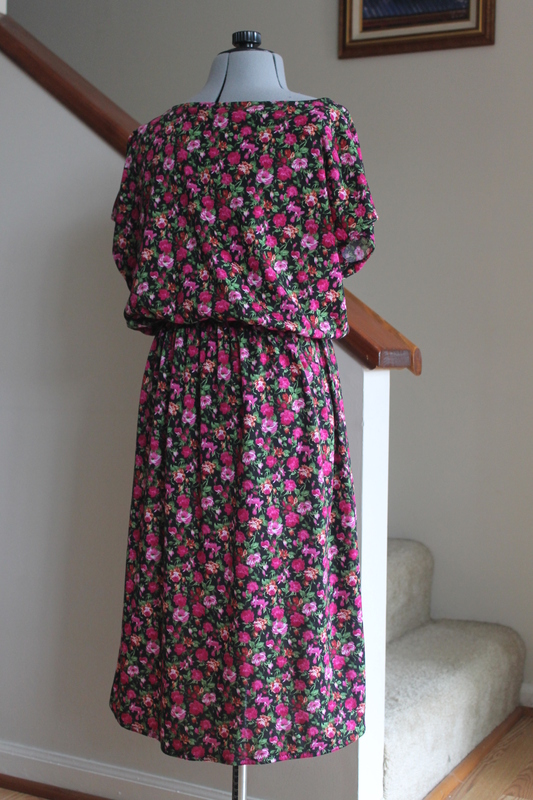 I’m still learning the functions of my camera so the damask like pattern on the dress doesn’t show up very well. The jacket is an Oasis biker jacket I got on eBay for a decent price. It’s not screen accurate but it’s a very close style. It is also in black since the gray version of the specific jacket I bought was more silvery than dark gray. The tights are Merona tights in dark grape/violet and were purchased at Target. 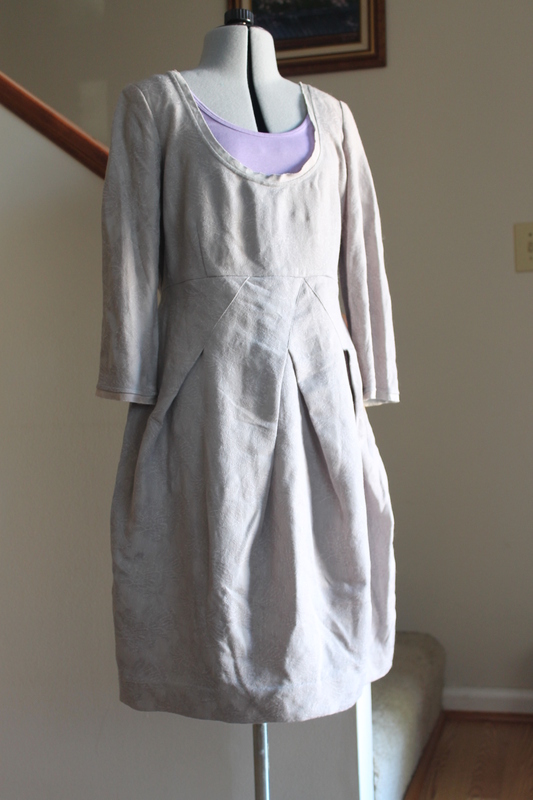 To make the tank top underneath, I took a white Merona tank top I already owned and dyed it to a more dusty lavender color. I used to own a top in the color needed but I wore it so often I tossed it long before. The scarf was knit using Capra Cashmere yarn in Caviar, Black, and Harbor. It was a simple rib pattern but it took me forever to figure out how many stitches to cast on. 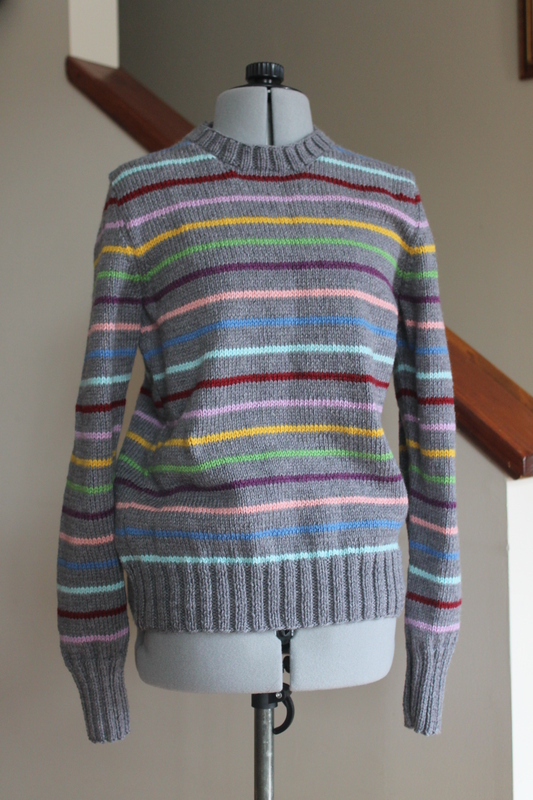 The rib pattern changes at the beginning and end; it took some time and a lot of questions to another knitter to figure out the correct stitch count for a k2p2 that changes to a k4p4 with a k1p1 edge all the way. I also have rings in rose gold plate that I purchased for dirt cheap on Amazon. The only items I will not have for this first wear is Amy’s A initial necklace and watch. I have alts on Etsy I plan to buy but ran out of funds before the con. Next wear I will have them. I will be wearing this to Banzai Con in Columbia, SC this coming weekend. Hopefully I’ll have better pictures taken by my more experienced photographer friends. Normally I am a t-shirt and jeans girl. But lately I have been heavily influenced by the new autumn items at Modcloth, by Peneloping and her creativity, by Jess’s style in New Girl, and by Clara’s style in Doctor Who. I have been impatiently waiting for autumn and cool weather so I can wear skirts and dresses with tights and leggings (I do not like my legs bare so tend to wear a lot of hiking pants in summer since jeans are too hot). Red is usually not a staple color in my wardrobe. I’m rather drab with mostly blacks, grays, and darker tones. But I have been gravitating towards bright colors to help with my mood (which has been somewhat down lately). Jess’ red dress in New Girl is just what I need. 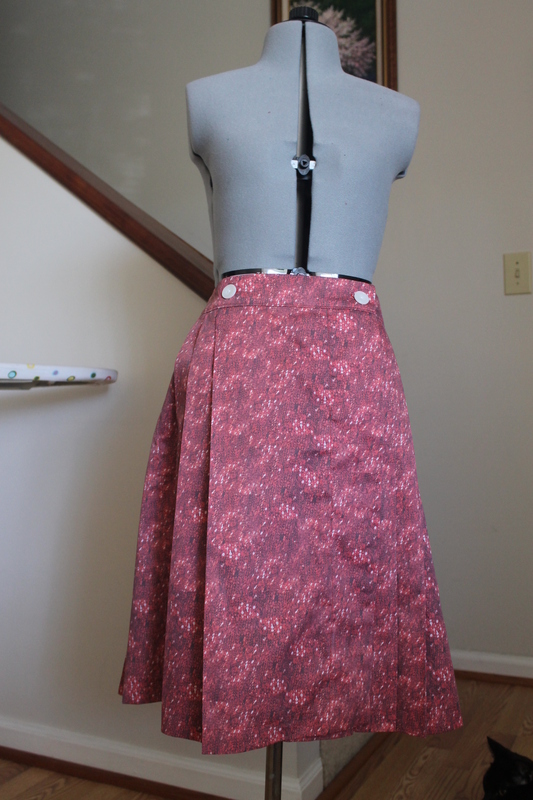 I used practically the same patterns Peneloping did (Burda 7309 for the bodice, Burda 7739 for the sleeves, and Simplicity 1873 for the skirt). 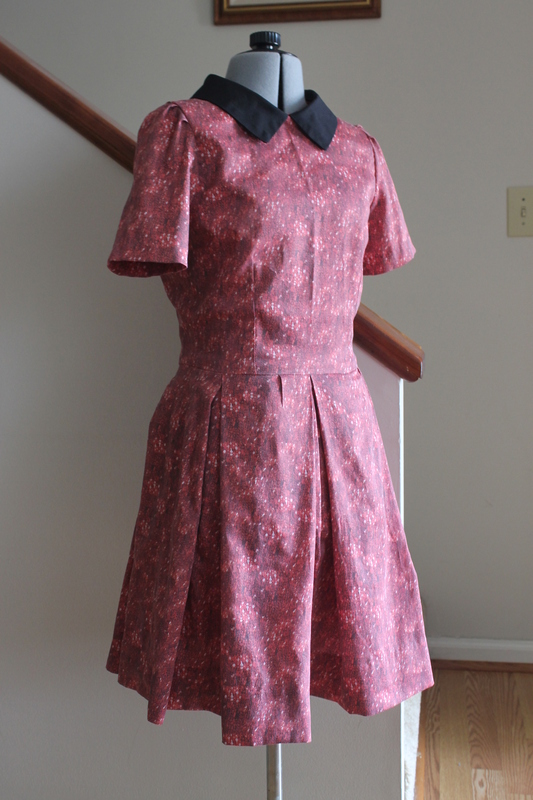 I didn’t intend to; I was going to use just the Burda for the bodice but the pattern(s) I wanted to use for the skirt were not going to work out. 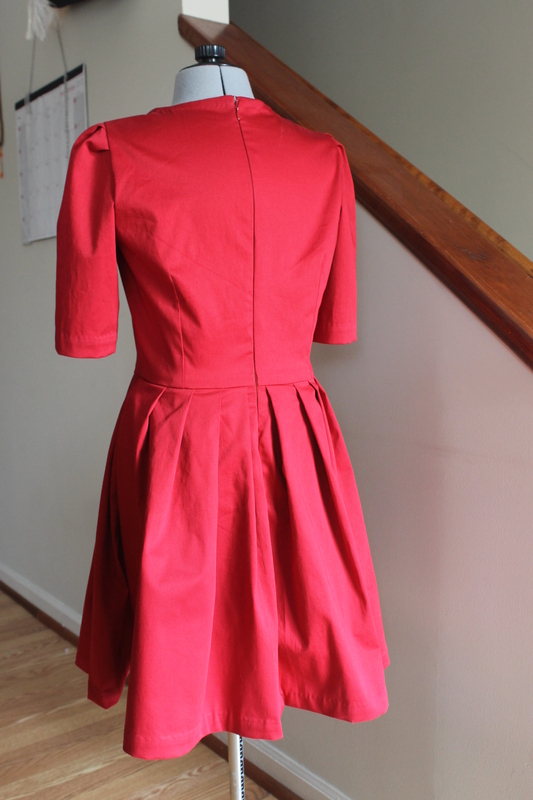 Also, using Burda 7739 for the sleeves made them puffier than I intended but I like the effect. Normally I wear my skirts a little below my knees because I have ugly knees. 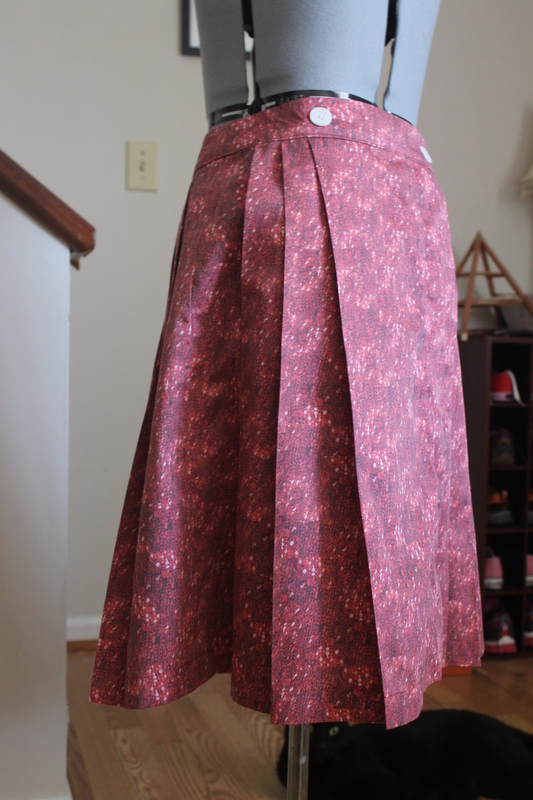 But I hemmed this one to just above the knee since longer made it seem dowdy. 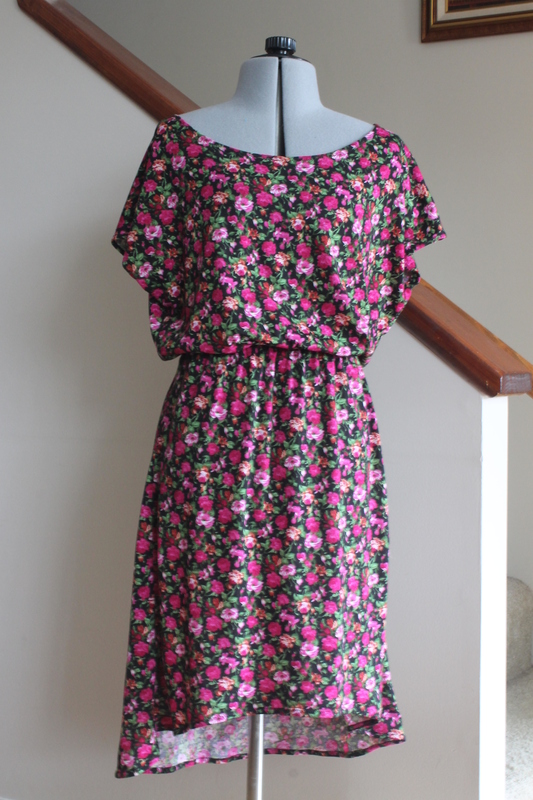 Since I don’t wear a lot of bright colors (my complexion is more suited to muted, darker colors), I intend to wear this dress with accessories to tone it down. I am already knitting a Marion cropped cardigan in a light gray wool and it’s going very quickly.